Precision CNC fabrication requires a team with the knowledge and experience plus state of the art equipment to fabricate your complex machined parts. 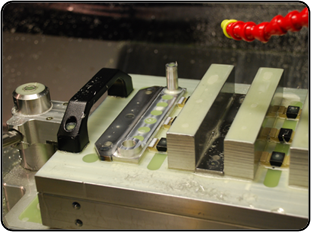 Our team uses 4 and 5 Axis machines for your most complex machining requirements. The benefit to you: Quality precision parts, cost effective solutions and quick turn lead time. Milling, turning, honing, boring, drilling, gun drilling, castings, assembly, 4 and 5 axis milling. Materials: CRS, stainless, aluminum, inconel, plastic, titanium, and exotic materials. Manufacturing location: All based in Southern California.